Q: What exactly is the ideal monitor height? A: Monitors should be set so that the top of the screen is roughly at eye level when you are sitting up straight. Why? – Relaxed posture for the human eye is 15˚ below the horizon. We all slouch occasionally, so before you know it your relaxed eye is focused in the middle to upper 1/3 of the screen… that’s where most of our work is, you’re probably reading most of this article in that portion of the screen! How? – Find some phone books or stacks of paper from your photocopy room and place them beneath your monitor, or look into getting a height-adjustable monitor from a retailer (a good investment if you’re sharing the workstation). Q: How far away should your monitor be positioned from your eyes? A: It depends on your vision, if you catch yourself leaning forward or squinting to view the screen it’s too far away and you need to pull it closer! Why? – Your head weighs as much as a bowling ball! 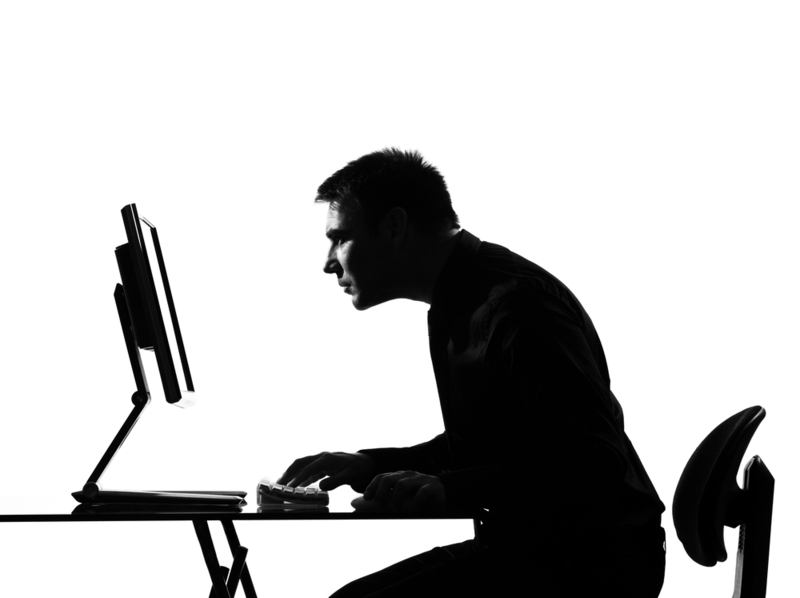 When you lean forward and squint at the monitor, you are taking it out upper back and shoulder muscles! How? – Pull the monitor closer! … with the advent of flat screens everyone seems to push their monitor farther away to regain desk space, but that has spawned a generation of ‘leaners’ with sore necks and upper backs! If you can’t part with the debris on the front of your desk to bring your monitor closer to you, then try keeping your chair tucked in close to the front of the desk so you bring yourself closer to the monitor. You can also consider investing in an adjustable keyboard tray, so you can use the space on the desk to write. Q: If I pull my monitor closer, won’t it bother my eyes or project ‘radiation’? A: Worries about monitor radiation from CRTs were resolved years ago, and flat screen technology is totally different and much easier on the eyes. If you find the monitor is too bright or it bothers your eyes to have it close try adjusting the brightness and contrast. (But don’t get too close – minimum recommended distance is 16”). How? – Those little buttons on the bottom front of your monitor case adjust the screen brightness and contrast. It might take a bit of trial and error, but once your monitor is set for your vision your eyes will thank you! Q: Where should I set up my monitor in the room? How? – If you have your desk directly against the same wall as a window, move it to the adjacent wall. This will reduce glare and contrast and reduce eye discomfort. Q: What if I wear bifocals or progressive lenses? A: Bifocal wearers typically look out of the bottom of the lens to view the monitor so to avoid tipping your head up to view the screen, set the top of the monitor 3” -4” below eye level. How? – Lower your monitor as much as possible. If you’re still too high try the following tips: Sneak your chair up a bit to get your eye level above the top of the monitor OR position the work on your screen a few inches lower. You’ll lose a bit of screen area but your neck and shoulders will thank you! Your monitor should be lined up directly in front of you so that you don’t have to twist your neck to view it. Saunders, M.J. (2004). Ergonomics and the Management of Musculoskeletal Disorders. Butterworth Hienmann, St. Louis. • Static Posture – Can Staying Still Hurt Me?